Malaysians have ousted their corrupt prime minister and opened the door for fundamental reform. On May 9, Malaysians threw the bums out, voting decisively against the Barisan Nasional (National Front, BN), the coalition of broadly right-wing and center parties that had governed Malaysia since independence in 1957. The election poses the question: has Malaysia bucked a global anti-democratic trend? The conventional wisdom is that a feisty, beleaguered opposition coalition made up of a somewhat motley mix of leftist catch-all, progressive Islamist, and communal parties bested the behemoth BN by force of ideals, pluck, and the charisma of a former “dictator,” as the new prime minister now delights in branding himself. The BN’s decrepitude, born of too many years of untrammeled authority and political inbreeding in a cronyistic, dynastic order, cleared the way for new leaders. All the while, rising costs of living, increasingly stark economic inequality, and spreading awareness that the state- and party-controlled mainstream media were not telling the whole story had left the mass of voters hungry for change. The Malaysian narrative is one of voters reflecting critically on a well-lubricated patronage machine and rejecting it, at least in part, out of aspirations for democracy, justice, and good governance. But like any good story, this one has a more complex plot line than that, peppered with stratagems, reversals, and ironic turns. What too-pat narratives obscure is the wider context and what we might expect — and voters might seek — to change or maintain. At the helm now, thanks to a weird twist of fates and strategy, is one-time prime minister Mahathir Mohamad, one of the world’s longest-serving heads of government — and also now among the oldest, as he approaches his ninety-third birthday. Although he did voluntarily step down in 2003, after twenty-two years in office, Mahathir has continued to yank at the strings of state since then, and had become increasingly apoplectic at incumbent Prime Minister Najib Tun Razak’s running the party and government, per Mahathir’s reading, into the ground through rent-seeking verging on plunder. To hear breathless popular accounts of the “Mahathir factor,” one might assume ethnic Malays — who, together with smaller indigenous groups, collectively termed Bumiputera, comprise slightly more than two-thirds of the population — to be blindly feudalistic, swiveling to heed the call of their once and future master. (Just under one-quarter of Malaysians are of Chinese ethnicity and about 7 percent, Indian.) Mahathir does have his devotees, but to some extent, this common narrative reflects media sensationalism more than reality. Frustration with rank corruption, inequality, and poor governance galvanized many or most opposition supporters, independently of the icon propounding those messages. Nevertheless, Mahathir’s savvy articulation of his coalition’s objectives and BN pathologies, as well as his charisma, helped to tip the scales. Initially organized as the three-party Alliance, the BN structures itself largely along communal lines. Its core parties represent ethnic Malay, Chinese, and Indian Malaysians, respectively. First among nominal equals — and increasingly dominant over the years — is the United Malays National Organisation, UMNO, Mahathir’s home since its founding in 1946 until he left and launched Parti Pribumi Bersatu Malaysia (Malaysian United Indigenous Party, PPBM) in 2016. Essentially ideology-free otherwise by this point, the BN claims support for having delivered development, with something for (almost) everyone. Opposition parties tend to cluster largely in an Islamist camp dominated by the Parti Islam seMalaysia (Pan-Malaysian Islamic Party, PAS), or else along class lines, from a Socialist Front defunct by the early 1970s; to the social-democratic Democratic Action Party (DAP), rump successor to the People’s Action Party after Singapore’s short-lived merger with Malaysia in the mid-1960s; to the small but embedded Parti Sosialis Malaysia (PSM). To take on the BN required merging these camps. First-past-the-post voting rules, coupled with heavy-handed gerrymandering and constituency malapportionment, often make three-cornered fights difficult for the opposition; pre-election coalitions are a must. That imperative is at the heart of any assessment of how far Malaysian political alternatives have come and where they may be going: Malaysia’s sociopolitical landscape makes for quirky pairings. Coalitions require glorification of the least common denominator. Starting in the late 1990s, that galvanizing, offensive-to-few message came to be “justice,” centered initially around sacked, then imprisoned former UMNO deputy prime minister Anwar Ibrahim and his purpose-built Parti Keadilan Rakyat (PKR, People’s Justice Party). Now, in the wake of one of the world’s largest money-laundering and graft sagas, that of the 1Malaysia Development Berhad (1MDB) sovereign-wealth fund, the message centers around an obvious anti-corruption theme. The coalition had maintained a non-communal premise since an initial foray as the Barisan Alternatif (Alternative Front) in 1999. Now it includes a Malay-communal party: Mahathir’s PPBM, made up mostly of his fellow exiles from UMNO. Having made incremental, inconsistent headway in cementing cooperation and securing seats since the late 1990s, the opposition coalition — reconstituted first as Pakatan Rakyat (People’s Pact), then as Pakatan Harapan (Alliance of Hope) — gained control of several states, and now the federal government. In the last election, in 2013, Pakatan Rakyat won a slim majority of the popular vote but fell short of winning the federal government. This time, Pakatan Harapan won the government with just shy of a popular-vote majority, given divided support for the BN and the no-longer-in-Pakatan PAS, which remains independently potent in Malaysia’s northeast. The BN is left in shambles, its remains eroding further by the week. Pakatan Harapan is up and running, but it is not entirely clear yet how far or how fast. Pakatan Harapan will surely make positive, progressive changes to what has become an ossified, decreasingly legitimate, increasingly illiberal system. Already they have begun investigating ousted prime minister Najib Razak and wife Rosmah Mansor — whose penchant for exorbitantly priced handbags rivals Imelda Marcos’s yen for shoes — and the 1MDB saga, the convoluted, seedy story of how Najib and various others misappropriated an estimated several billion dollars from a state investment fund launched in 2009. More than that, the new government has spoken plausibly of plans, once parliament convenes in July, to revise or revoke controls on media, association, and speech; to release the political reins on schools and universities; to implement open tender and stronger oversight on government contracts; and more. Heads of statutory boards are starting to roll, and bloated or needless government agencies are coming under scrutiny. Most cabinet appointments, finalized only in mid June, reflect real expertise rather than political concessions, as under the BN model. 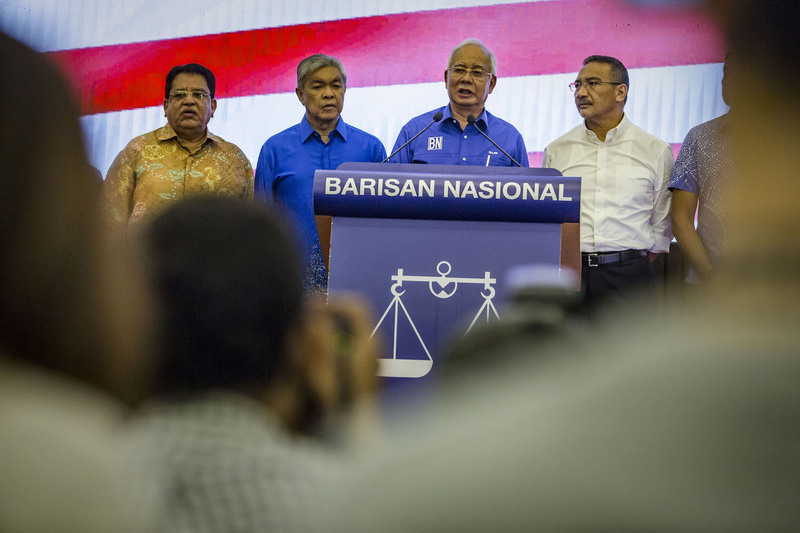 The coalition itself is far more equally balanced among its component parties than the BN ever has been — and that those parties do differ in meaningful ways, in their goals or membership, ensures a wider range of alternatives may reach the policy table. Already the results have reset the stage for states’ rights, too. Leaders of awkwardly incorporated, underdeveloped Sabah and Sarawak, states on the island of Borneo, hundreds of miles across the South China Sea from the peninsular mainland, have broken with the federal BN — not just eviscerating their former coalition, but staking a firm claim to fairer status and reward in the federation. If Malaysia is to emerge from its increasingly authoritarian past, having this new government emplaced is a good thing. Yet of course, it will not change all things, and it may achieve far less than years of opposition manifestos have pledged in terms of ushering in a more equitable, consultative order. Two lenses are especially germane in understanding the capacity and limits of reform, given this mix of old and new: economic policy, including the extent of communalism (as codified especially in far-reaching race-based preferential policies); and the tension between a highly personalized (however party-centered) and more issues-based or ideological politics. First, economics. Survey after survey suggests the key issue for Malaysians, election after election, is the economy, and particularly rising costs of living. However, a thick tangle of affirmative-action policies to favor Bumiputera, dating to British colonial times but strengthened under the 1970s New Economic Policy (NEP) and a series of successor plans, tempers what it means to prioritize household economics. The UMNO-led BN has held pro-Malay policies to be sacrosanct. Revising the criteria for qualification to be need-based rather than race-based would not dramatically shift the beneficiaries; race and class substantially align, particularly since the benefits of preference have flowed disproportionately to already-wealthy “UMNOputera,” the well-connected ruling-party elite. A better lens on economic voting in Malaysia considers not just financial standing, confidence, and progress since the last election, but which party voters trust to manage the economy. Here we see an ethnic divide, with Malay voters typically disproportionately trusting UMNO, whatever they think of the party otherwise. The most plausible explanation is that these voters believe the best way to ensure their economic wellbeing is by maintaining preferential policies, on which opposition parties, but never UMNO, have equivocated. The Malaysian constitution grants Bumiputera special stature in the polity; accumulated norms (backed by potent sedition legislation) translate that standing to irrefutable political dominance and economic privilege. At no time has Pakatan seriously challenged Malay primacy, but they have promised a less communally structured economy. Pakatan’s embrace of the communally focused PPBM shifts the key. Critical to the coalition’s gains this time, especially in winning over Malay voters, appears to have been the reassurance Mahathir — whose early writings inspired and informed the NEP — and his party offered, that Pakatan would uphold pro-Malay policies. Now in office, the coalition has limited room for maneuver, especially with their main opposition still Malay-based (in UMNO as well as PAS) and only a slim parliamentary majority. Importantly, since taking office, Mahathir and his government have insisted on their determination to maintain an even keel: to push back against some mega-investment from China, perhaps, and to cancel at least one particularly costly boondoggle — a high-speed rail line between Kuala Lumpur and Singapore — but to keep investors confident. Mahathir is Malaysia’s original megaproject mastermind: the “national car” intended to galvanize industrialization in the 1980s (Proton, short for Perusahaan Otomobil Nasional, or National Automobile Company, 49.9 percent owned by China’s Geely Holdings as of last year), the Petronas twin towers, an extravagant new capital at Putrajaya: glamorous, expensive grand gestures intended to signal Malaysia’s developmental success. His newly appointed finance minister, the DAP’s Lim Guan Eng, previously the chief minister of prosperous, opposition-held Penang state, likewise caught flak there for his coziness with developers and embrace of ambitiously grand infrastructure and real-estate projects. These economic impulses and incentives taken in sum, we should assume an at least somewhat more transparent, less cronyistic system, but still with a heavy emphasis on foreign investment–led, large-scale developments (with requirements intact to ensure Malay contractors’ protected share in the bounty), faith in the blessings of neoliberalism, and politically fruitful (commonly dubbed “populist”) wealth-sharing to amplify otherwise-tepid trickle-down effects. More broadly, both coalitions are neoliberal at their core. Both offered a host of makeshift measures to reduce the pinch of rapid, top-heavy development, ranging from targeted cash-transfer and voucher schemes (for children, students, seniors, newlyweds, the bereaved, housewives, entrepreneurs, and the poor), to subsidized utilities, to reduced road tolls. But neither suggested any fundamental branching from that economic path beyond, for instance, expanded educational opportunities to prepare Malaysians better to embrace the modern economy. Second, like the government it replaces, Pakatan is highly leader-centered, to the point of obscuring an emphasis on issues or ideology. Its commitment to term limits is a definite improvement (while Mahathir’s old age offers reassurance of his own commitment not to outstay his welcome; the plan is to hand the reins to Anwar within about two years). Yet Malaysian politics has been and remains deeply clientelistic across parties, despite significant overseas and internal rural–urban labor migration, economic diversification, and sufficient state capacity that party machines should be off the hook for welfare services. A “personal vote” matters even when parties are at their most pulled-together — and even those candidates able to coast on their party’s coattails prioritize “going to the ground” for grassroots constituency service and mingling among the masses. However much media and pundits exaggerate the extent of his personal responsibility for Pakatan’s win, Mahathir did help to tip the scales, and it remains to be seen what Mahathir the man represents vis-à-vis a reform agenda. More to the point, that the best Pakatan could do in terms of a broadly palatable leader — realizing the imperative in Malaysia of a leader to lead the charge, no matter how deeply unpopular their rival — was the long-retired Mahathir, architect of the system now in place and whom so many within PH once reviled as a despot, could bode poorly for its sustainability and depth of support. On the other hand, Pakatan has a clear advantage on this score — though less in Mahathir’s PPBM than in its partner parties. Spurred not least by predations during Mahathir’s previous longue durée, Malaysia has developed a vibrant civil society, encompassing not only largely urban, middle class–based advocacy NGOs, but also mass-based Islamist organizations, deeply embedded communal and cultural associations, and more. Many of these groups, from Chinese educationists to Muslim dakwah activists to human-rights campaigners, have a clear political, and often partisan, orientation. That rootedness in civil society gives Pakatan not only a loyal base of volunteers for get-out-the-vote and other efforts, but also reinforces its orientation around issues of better governance, social justice, and civil liberties. That said, Pakatan’s record of governing at the state level revealed greater ambivalence than many activists had expected about their collaborating with advocacy NGOs in particular. Even many Pakatan legislators who cut their political teeth in those same NGOs came to consider their one-time colleagues too single-issue-oriented or impatient for improbably sweeping change and found the constant pressure irksome. Moreover, women’s organizations in particular have urged all parties to improve the gender balance in representation in public office. While these efforts have yielded aspirations and quotas, no party has come close to meeting them, even for appointed offices with a clearly sufficient female pool from which to draw. So while the close ties between civil society and Pakatan parties bode well for generating sufficient new leaders to sustain real competition, among candidates with skills and experience for leadership roles, recruitment could still fall short in terms of enhancing representativeness and idealism in practice. And at the end of the day, there is always another election ahead. Pakatan developed under BN rule; it may hesitate to change the rules of a game it has only so newly mastered. Nor can it risk losing its lead. Some Pakatan support is proactive: champions of change, away from the too-long-entrenched BN and toward cleaner, more accountable and responsible governance. Some, though, is reactive: voting against Najib, but without necessarily seeking any dramatic overhaul beyond that purge — hence the appeal of not-too-different PPBM and Mahathir. To win a second time, Pakatan needs to keep both camps in its corner. Unless electoral rules change (unlikely, although entirely reasonable to consider) or something else goes really awry in Malaysia (always possible), the wider frame of these recent elections suggests observers keep their expectations of systemic change in check. What the wider context suggests is something in between: an order that increases the political space for, and responsiveness to, alternative voices and ideas, within and outside parties; that does less to stifle efforts within civil society toward more coordinated, efficacious advocacy; and that encourages — even just by dint of a multipolar electorate and fissiparous coalitions — real competition around principles as well as personalities. Malaysia has opened the door to fundamental reform, even if new leaders do little more than peek around the corner in these early stages, and even if its citizens opt ultimately to update the décor rather than shift the socioeconomic foundations of the state. Meredith L. Weiss is professor of political science at the University at Albany, State University of New York.